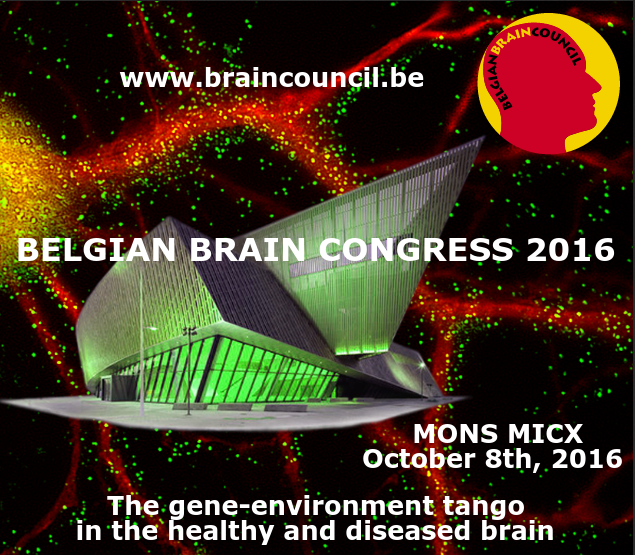 On October 8th 2016, the town of Mons will welcome the 6th edition of the Belgian Brain Congress. entitled “The gene-environment tango in the healthy and diseased brain”. Unique in its form and objectives, the BBC congress opens the dialogue between all relevant stakeholders and expertise for a better understanding and a more efficient management of brain disorders. Clinicians, researchers, representatives of patients and pharmaceutical industry are invited to participate to this important meeting taking place every two years in Belgium. The interplay between gene expression and environment is a major actor of most of neurological and psychiatric disorders as well as normal brain functioning. This congress therefore offers the opportunity to address a lot of different questions ranging from basal ganglia function to narcolepsy. In line with the BBC mission to bridge the different points of view, scientific sessions will approach basic science, neurology and psychiatry and will give the opportunity to patients’ associations to take an active part to the discussion. A better understanding of the relation between our heredity and our environment, socio-cultural, economic or natural is essential to improve the prevention the detection and the treatment of brain disorders. During the congress, Belgian and international experts, as well as young researchers in Autism, Epilepsy, Narcolepsy, Multiple Sclerosis Endocrine disruptors and Learning and Memory will present their recent findings on this complex interaction. See the official invitation & Programme.